This conversation will look at the stakes of working site specifically. The dialogue takes place within Pyramid Selling, an installation created by Glasgow based artist Mick Peter. Berlin-based Monika Grzymala and Seattle-based Victoria Haven will each make a site-specific work for Line, an exhibition guest-curated by Drawing Room for Lisson Gallery. Grzymala uses a ready-made line in the form of sticky tape which criss-crosses three-dimensional space, and the form created is a visual manifestation of the energy and time she invests in the production process. 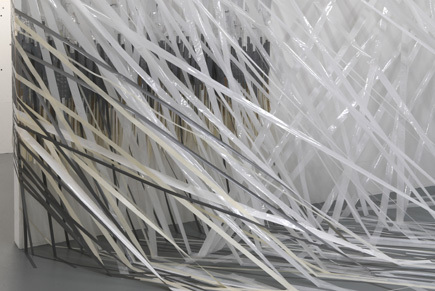 To this end the medium is described thus: ‘ephemeral site-specific installation’, and the type and quantity of tape is specified. Haven produces subtly coloured and contoured lines that are conceived to play visual tricks, with the blank space of the wall simultaneously advancing and receding. At the close of the exhibition, Haven’s wall drawing is scraped off, and the remnants are painted over, whilst the many metres of tape that make up Grzymala’s installations are rolled into balls which are retained and exhibited as ‘deinstalled works’.